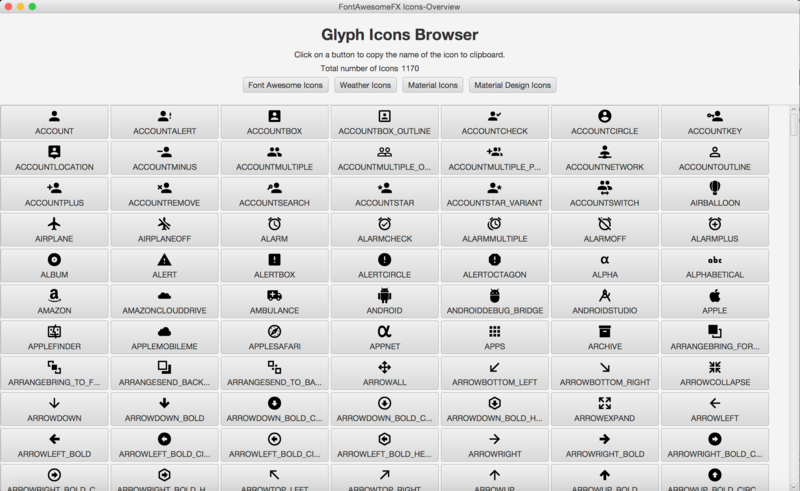 FontAwesomeFX 8.6 comes with a new Icons Font: Material Icons. (thanks to John Sirach for his request). Actually it’s 2 new Icons Fonts: The original Material Icons Font from Google (around 800 icons) and Material Design Icons (around 1200 icons). Basically Material Design Icons cover the Google Icons extended by a lot of additional community driven icons. As I am not sure that all Google icons are included I have also kept this font. Additionally I have upgraded to Weather Icons 2.0 (now 215 icons). Is the Glyph Icons Browser part of the distribution? The Icon Browser is part of the “test” packages and these are not included in the release to keep it as small as possible. Somewhat of a Java newbie here — how do you launch the icons browser? Could share an example using FXML? have a look here http://wp.me/p38FCL-vN and let me know if you need more input! I am pleased to share! is this free for commercial? Yes, FontAwesomeFX is under Apache 2.0 license. Btw. in which product is it intended to be used?